The most glamorous stars lit up the red carpet as they kicked off in spectacular fashion at the Aria Awards. And musicians, reality television stars and social media personalities showed off their glitziest outfits in an effort to make their mark on the best dressed list at Sydney’s The Star on Wednesday. Here, FEMAIL rounds up the celebrities who certainly put their best foot forward on the night of nights in the Australian music industry. 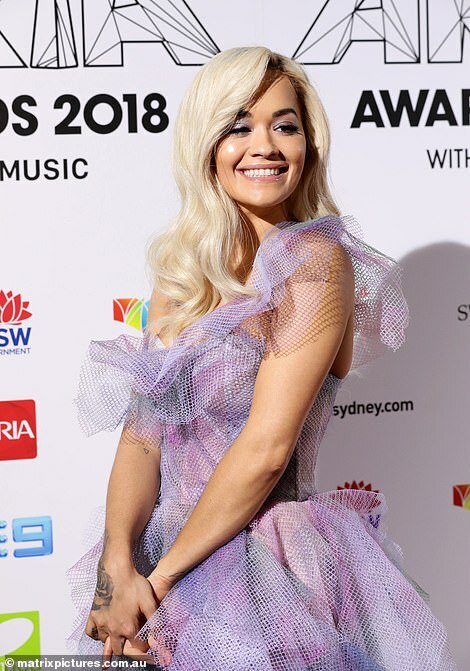 Stealing the spotlight, Rita Ora looked every inch the superstar as she lead the celebrity arrivals in a stunning one-shouldered princess-inspired purple ball gown. Somewhat more modest than her usual style, the fairytale floor-length gown was cinched in at her waist – and she styled her luscious blonde locks in soft waves. Sharing the limelight looking elegant, beauty influencer Sammy Robinson flaunted her svelte figure in a stunning white silk slip gown with thin straps. Television presenter Liv Phyland took the plunge in a daring silver playsuit, and she completed her rock n’ roll look with a pair of strappy stilettos and silver strand earrings. Love Island’s Tayla Damir looked nothing short of glamorous as she opted for a green frock in satin, featuring a revealing bikini style bust and a thigh high split. Following behind her was her fellow cast Cassidy McGill who looked stunning in an emerald green dress, with a fitted bustier. DJ Havana Brown channelled Sharon Stone in film Basic Instinct, sporting a white satin frock, with the short hemline revealing her trim pins. The 33-year-old elongated her frame with silver pointy-toe heels and complemented her long platinum locks with a slick of red colour on her pout. Former Neighbours star Sarah Ellen looked sophisticated in a sparkling black thigh-skimming frock, teamed with silver pointy-toe pumps.